As outlined in our feature highlighting Apple’s possible product plans for 2014, a number of rumors have suggested Apple may be working on a 12.9-inch iPad model that could launch later this year. The company is allegedly accelerating development on this device in response to Samsung’s introduction of two competing 12.2-inch tablet models, with market sources cited by Digitimes claiming that Apple is now prepping the so-called “iPad Pro” for a late Q3 2014 launch at the earliest. The claim that Apple’s timeline is motivated by a perceived need to match Samsung’s recent introductions seems doubtful given that Apple has routinely taken its time coming to market even in the face of competitors rushing to beat Apple to its own rumored products, but at a minimum the claimed launch target offers one more data point for those trying to predict a release. Some sources have predicted a launch as soon as early this year but such a timeline seems very unlikely given the absence of part leaks and other substantiating evidence. Earlier reports suggested the 12.9-inch iPad Pro could be a hybrid device that would appeal to enterprise customers looking for a machine that bridges the gap between tablet and notebook. Based on display panels currently under development in the supply chain, research firm DisplaySearch believes that the iPad Pro could ship with a 12.9-inch Retina display with a resolution of 2732 x 2048 and 265 ppi. 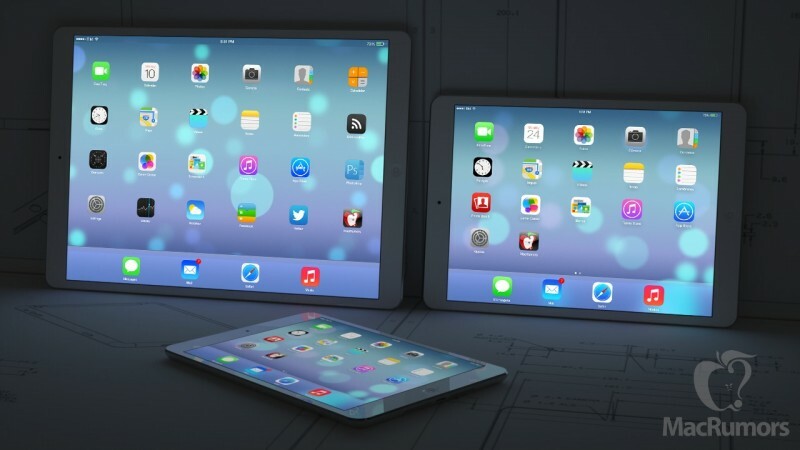 Besides the iPad Pro, Digitimes‘ sources unsurprisingly also claim Apple is working on new 7.9-inch and 9.7-inch models to replace the current Retina iPad mini and iPad Air. These models will likely debut in Q3 2014, keeping with Apple’s current late fall release schedule for the iPad. Demand for the iPad is expected to be strong again in 2014 with the company selling between 80 and 90 million units over the course of the year.